ROOM FOR THE DEAD – ”Ofredas Unidas” is an installation that explores the universality of death by loved ones who have passed by combining found objects, personal letters, acrylic images on plastic and three alters. White floating human silhouettes representing world cultures are suspended an inch from the enclosed walls that represent the spiritual “Other World” looking on to the viewer portrayed as Calaveras (skeletons). Two tables carry personalized place settings with offerings of letters that described the death of a family member, in particular focusing on the unique cultural expression observed within each family. These letters are an integral part of this installation as each is placed on a large white plate bordered by a large blue band. Eight place settings line the two white linen-draped tables, which stand about one foot from the hardwood floor. At each setting is a flower-print porcelain teacup and dotting the table are gourds, Indian corn, persimmons, and bowls filled with red and black beans, rice, walnuts, hazelnuts and chestnuts. Each place around the table has a seating cushion. The ample fruits and vegetables are symbolic of a feast, and the places are set in a formal way befitting the occasion. The center table included several green and purple votive candles, large blue and white candles and gold-leaf paper representing money for the spirits to spend in their new world. Two sand-filled silver bowls hold burning incense sticks. The installation invites community members to reflect on their own life experience. 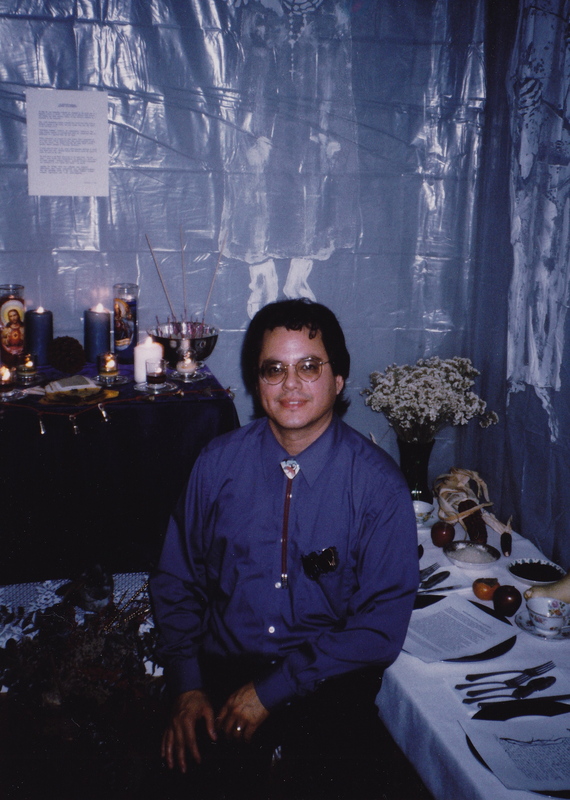 “Rooms and Windows for the Dead”, Installation title, ”Ofredas Unidas”, November 1992, Mission Cultural Center, San Francisco, CA.